But whatever you do, don't read anything after Jaka's Story, which was the pinnacle of Sim's storytelling. After that, it went rapidly downhill into misogyny, breaking the fourth wall, with rants about women, publishing comics, and, well, just general crazy. There is a theory that the most creative people have inextricably linked mental issues that at times are troublesome for themselves and those around them. They have fewer filters and so are more open to ideas. Kind of odd since both Frank and Dave are pretty closed minded when it comes to women. Their open mindedness is selective apparently. 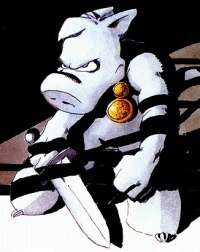 What's even odder is that actually, the end of the Church and State Cerebus arc contains some very strong, pro-feminist messages, speaking out against the abuse of women by men - then a few years later Sim snapped, his attitudes shifted dramatically, and he alienated a hefty chunk of his readership. Sim underwent a religious conversion from atheist secular humanism to his own mixture of the Abrahamic religions. He lives a lifestyle of fasting, celibacy, prayer, and alms-giving, and considers scriptures from the Jewish (the Torah, and Nevi'im), Christian (the Gospels, Acts and the Book of Revelation), and Islamic (the Qur'an) religions to be equally valid as the Word of God. This may seem like a quite grand shift, however it isn't so big if you think of it from the perspective of mainstream Jews, Christians, and Muslims. They disliked his philosophies just as much before as after. Heck, they would all probably prefer a secular to someone who truly believes their deities are one in the same. Well, the two aren't necessarily mutually exclusive. :P Or in this case, might be consecutive. The religious influence didn't start to seriously manifest until Rick's Story, but the five Cerebus books that came before that... whoo. If he found something to give him focus and direction, great; but reading the comics... He was not in a sound frame of mind. If you want another comic artist going through weird transitions, Chester Brown for a while had a comic book going with his uber-politically-incorrect Ed the Happy Clown story in the front, and the back had a re-telling of the Gospel of Mark. I'd just like to add that there is a full length animated feature in development for Cerebus as well. I've done some texture work for a few characters for the film. Unfortunately, the site hasn't been updated in a while and isn't exactly exemplary of the current quality. But, facebook page gets updated a lot! How's it going to end, with the voice of Sim telling us women don't have souls and shouldn't have the right to vote? Lotsa luck with that. I suspect you might not be completely informed, but anyway: the movie is based on the earlier issues, pre-High Society. If it pleases you consider it celebrating the comic and it's creator when they were liberal.